The twists and turns of the last tracks left by humans on the moon crisscross the surface in this LRO image of the Apollo 17 site. In the thin lunar soil, the trails made by astronauts on foot can be easily distinguished from the dual tracks left by the lunar roving vehicle, or LRV. Also seen in this image are the descent stage of the Challenger lunar module and the LRV, parked to the east. This story was updated at 10:31 p.m. EDT. 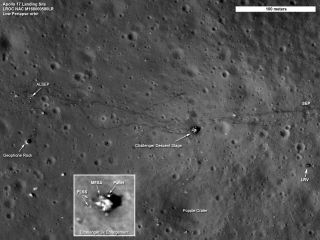 The paths left by astronauts Alan Shepard and Edgar Mitchell on both Apollo 14 moon walks are visible in this LRO image. (At the end of the second moon walk, Shepard famously hit two golf balls.) The descent stage of the lunar module Antares is also visible. With the moon's extreme hot and cold temperatures and ultraviolet environment, Robinson said it's highly unlikely that anything is left of the nylon flags after so many decades. Resolution comparison between nominal orbit images of the Apollo 17 landing site and the new low orbit image. The tracks made in 1969 by astronauts Pete Conrad and Alan Bean, the third and fourth humans to walk on the moon, can be seen in this LRO image of the Apollo 12 site. The location of the descent stage for Apollo 12's lunar module, Intrepid, also can be seen. This story was updated to correctly reflect the statements made by scientist Mark Robinson referring to the U.S. flags on the moon.